Aesthetics and Buddhism have been inseparable forever. This is quite evident when we closely observe the handful of films that depict Buddhist culture and ideology. In this backdrop Patachara, Angulimala, Satharapera Nimithi, Ajasaththa, Vesathuru Siritha, Adhishtanaya, Sankara, Ransalu and Uppalawanna still roam in our minds. But it is none other than Sanath Abeysekara who diverted from the traditional path to produce Mahindagamanaya to mark the 2600th Sambuddhathva Jayanthi. The film which mirrors bequeathed legacy of Buddhism has reached islandwide audience. Sir Lester James Peries even amid harsh criticism made the turning point by producing Rekhava , which escaped the pattern of early Sinhala movies Kadauna Poronduwa, Ashoka Mala and Kapati Arakshakaya that followed the Indian film tradition. Lester further spearheaded Sinhala cinema by producing Sandeshaya and Nidhanaya. The trend was further nourished by left front movie makers, notably Dharmasena Pathiraja (Ahasgauvva, Bambaru Avith) Wasantha Obeysekara (Walmathuvo, Palagetiyo) Dharmasiri Bandaranayake (Hansa Vilak, Thunveni Yamaya). A list of prominent figures of a generation who have nourished the local cinema include Sumithra Peries, Tissa Abeysekara, Prof Sunil Ariyaratne, Prasanna Withanage, Prasanna Jayakodi, Benett Ratnayake, Jayantha Chandrasiri, Jackson Anthony, Inoka Sathyangani, Somaratne Dissanayake and Ashoka Handagama. They have all analysed society in different scopes while Jackson Anthony came up with Aba which gained popularity and criticism as well. Siri Sangabo and Andare also depicted Sri Lankan reign and the fresher Sanath Abeysekara dared to produce Mahindagamanaya at a cost of Rs 600 million. The making of the film was based in Thantirimalaya Raja Maha Vihara while Hambantota and several other parts in the island and India also became locations. The cast apart from the stars consisted of more than 200 characters. There was doubt that he could carry out such a complicated mission and at last he has done the job and will soon be judged by the audience. Devanampiyathissa was crowned twice during the period of 250-210 BC and Buddhism was introduced at the same time. The film reveals many interesting pieces of history. Sanath pays his special tribute to Venerable Gatamanne Gunananda, Ellawala Medananda, Pallegama Hemarathana Theras and Gamini Senarath for their immense support. 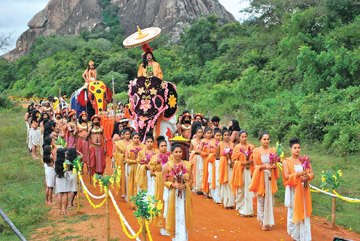 Jeewan Kumarathunge performs as King Devanampiyatissa while Dilahani Ashokamala takes the role of queen Anula. They both share the same idea of feeling lucky and be privileged with the characters.